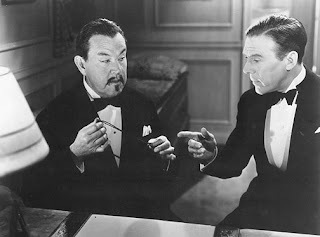 Most years saw 20th Century Fox releasing three feature-length Charlie Chan mysteries annually. After several pictures with Warner Oland in the role of the famous Honolulu-based Asian detective created by Erle Derr Biggers, the torch was passed to character actor Sidney Toler after Oland’s death. Toler acquitted himself magnificently and by the year 1940, he had created – what some might argue – the definitive Charlie Chan. Most importantly, Fox, as the studio generating the series, were able to keep the creative juice going so that the films, in many cases, got better and better. By 1940, rather than succumbing to the usual law of diminishing returns, the Chan series saw three of the best released all in the same year. “Charlie Chan’s Murder Cruise” is as entertaining and engaging a Chan picture as one could imagine. Directed by one of Fox’s prolific B-and-small-A-picture stalwarts, Eugene Forde, the movie opens with the grisly strangulation of Chan’s best friend Duff, a Scotland Yard inspector who meets his fate in Chan’s office no less. Duff has been investigating a murder amongst a group of passengers on a round-the-world cruise. Chan joins the tour for its final journey from Honolulu to San Francisco where, in typical fashion, he not only solves the murder, but also in so doing, avenges his friend’s death. The tale is a tad familiar (beyond the successful Chan formula) as the picture borrows a very significant item from “Charlie Chan in Paris”. It is also, most notably a remake of the earlier Warner Oland Chan vehicle “Charlie Chan Carries On” (one of the lost Chan pictures that hopefully will one day turn up) and both the original and the remake are based upon the hard-boiled Biggers novel. A Spanish-language version filmed simultaneously with the Oland version, entitled “Eran Trece” remains extant and can be seen on Volume One of the Fox Charlie Chan DVD series. “Murder Cruise” is, possibly because of its relative adherence to the Biggers novel, reasonably hard-boiled. The murders are not only pretty intense and almost serial-killer-like, but the first on-screen murder includes the dead character possessing the killer’s curious calling card – thirty pieces of silver. This becomes a tale of both betrayal and retribution. In spite of the darker tone, the film is still imbued with the wonderful sense of humour that became a hallmark of the Toler Chan pictures. Many of the laughs come from the delightful interplay between Chan and his Number Two Son, the bungling, wide-eyed, prat-falling Jimmy (the always delightful Sen Yung), but there’s also a magnificent comic turn from the daffy Cora Witherspoon as a scatterbrained socialite whose ludicrous, confused descriptions of various suspects raise more than a few eyebrows. And as always, the Chan films would not be complete without a clutch of sinister supporting performances and “Murder Cruise” provides not one, not two, not three, but four such great actors. Claire Du Brey and Charles Middleton are on hand as an American Gothic-styled couple (resembling a cross between funeral home owners and bible thumpers). The great Leo G. Carroll appears as a seemingly benign archeologist and rounding things out is the astoundingly perverse Lionel Atwill (whom will forever be remembered as the wooden-armed inspector from “Son of Frankenstein” so gloriously parodied in Mel Brooks’ “Young Frankenstein”). Atwill portrays the somewhat Franklin Pangborn-like cruise director. This, I assure you, must be seen to be believed. Ultimately, though, like most of the Fox Chan pictures, “Murder Cruise” simply has to be seen. “Charlie Chan’s Murder Cruise” is available on DVD as part of Volume 5 of the Charlie Chan Cinema Classics Collection from 20th Century Fox Home Entertainment.